Although as an adult, I’m not a practicing anything, each year I find myself designing a homemade, DIY version of Lent. I’m drawn to the story of Jesus having to wrestling his demons, literally and figuratively, alone in the desert for forty days to find the clarity and strength to go forward with his purpose. Most religions have a prescribed season for spiritual re-booting. Lent promises redemption if we can embrace and accept our mortality. It’s the ultimate, no-frills, badass instruction guide on how to be human and find our best selves through our weaknesses. Jesus was not a wimp. The season arrives on the calendar just as my lofty, good-intentioned New Year’s resolutions fade. The new year promises a quick fix while Lent is the real deal – transformation through disciplined action. I believe that true freedom, not the mindless kind that comes with passivity or the jagged edge from defiance, can only develop with discipline. It’s about confronting duality to find balance. Too often I’m like a fish jumping at every bait that dangles above the water – habits, teenage drama, the internet, even happiness. We all know the feeling of twisting and flailing on the line, hook-in-the-cheek caught. Prayer, fasting, and service – the traditional pillars of Lent – provide a container to hold my wandering attention span. There’s a nurturing austerity inherent in the season that helps me filter the distractions of everyday life. I ask myself to make changes, to look within, to try something different, to think about my purpose in the the context of my mortality. 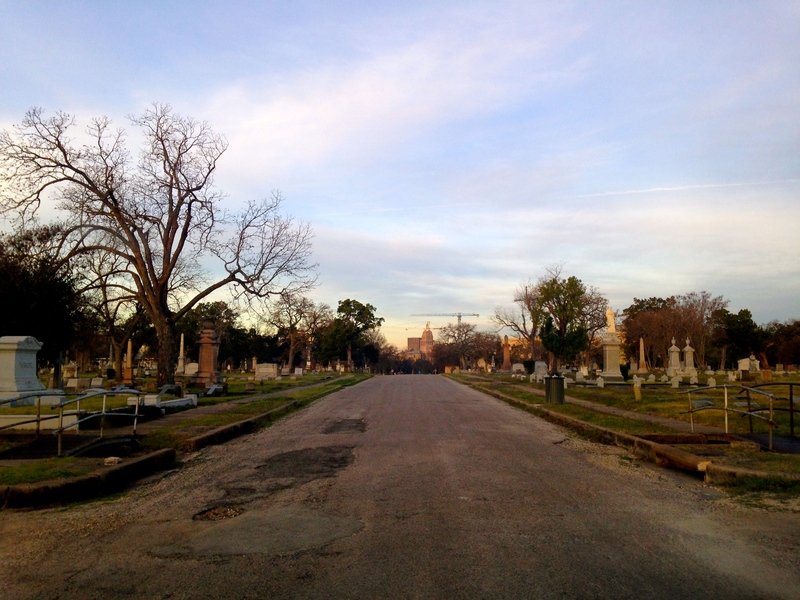 This year my desert is the Oakwood Cemetery. Dating back to the 1850s, it sprawls out over forty acres on the east side with a view of downtown. It’s the resting place of paupers and city founders alike. It’s on my route to the kids’ school. After drop off, I drive into the cemetery, park the car, and look out toward the capitol and at the cranes that are building new spaces for the living. I sit, usually for ten minutes or so, and think about that fine line between life and death. I’ve been terrified of death my entire life. Ironically my father’s dementia has made me less afraid. When I watch him dissolve away slowly, I realize that I need to be careful about how tightly I hold on to my own story, much of which researchers tell us is distorted and fabricated in our minds. My father has shown me that the story of the Self is an illusion, and when it fades, all that’s left is the soft animal, a human being who will die. My prayer and meditating this DIY Lent is about learning to live fully in celebration of the finite experience of being human. It’s a committed, day-to-day effort that requires gratitude, moderation, and insight. My fasting takes the form of not giving in to the fearful, toxic thoughts. I want to build each day from a foundation of kindness, patience and community. If I can manage to do so, more days than not, then my story will take care of itself.